All make overs are provided with a detailed copy of products used. **NEW** JANE IREDALE - liquid minerals for the older client or dryer skin. At Bliss we understand that your Wedding Day is a very important day. We also understand that Wedding are a very expensive time and with this in mind we have compiled a few simple Wedding Packages that are available for your special day. These packages are specially planned for you and are not subject to change. At Bliss we can offer Make up for any occasion, make up lessons and make up trails for special occasions. We recommend a trial for a special occasion and like to take a little longer with you, this will ensure you are happy with the result and give us an opportunity to ensure that all products you may need are available for you. 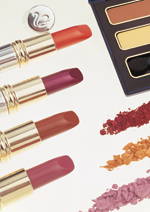 Make up lesson: We ask you to bring in your existing make up so we can help choose which products are good for you. We then advise on your colour choices and we show you how to make up one side of your face. We then help you to re-create this on the other side of your face. This treatment is extremely beneficial for clients who have no experience in applying make up, or for clients who wish to change their current make up style.